KANSAS AMBER ALERT ISSUED FOR 3 YEAR OLD ANTHONY HERNANDEZ. 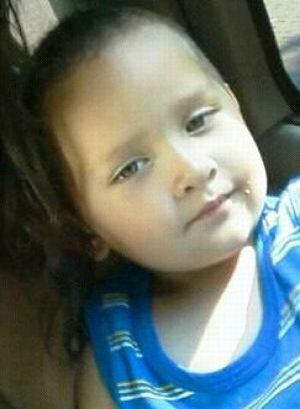 An AMBER ALERT has been issued by Ark City police for missing 3 year old Anthony Hernandez in Kansas. At approximately 11:30 pm. Saturday, June 30 that the 3-year old boy was allegedly abducted by force by the boy’s father, Anthony Lopez, following an altercation during a supervised visitation. Hernandez was last seen at 600 S 6th ST Arkansas City, KS 67005. Anthony Hernandez is believed to be with 33 year old Francisco Lopez. The father is described as a white male, about 5 feet, 5 inches tall and weighing 200 pounds. He has brown eyes and a bald head. Lopez drives a 2003 white Chevrolet Cavalier that has an Oklahoma license plate of 336 HPW. last seen wearing a yellow tank top, black shorts with yellow stripes and yellow SpongeBob SquarePants Crocs. UPDATE I: The suspect’s vehicle has been located but was found empty. The suspect’s vehicle has been located but was found empty. A crime scene and perimeter has been set up and local law enforcement officers, trained trackers, and the K-9 Unit are currently in search of the suspect and the child, who may be on foot in the Ark City area. Local highways are also being monitored. Trackers, a K-9 unit and law enforcement officers are currently searching for the suspect and child. Local highways also are being monitored. Lopez-Campos is a suspected gang member from Yonkers, N.Y. and has taken the child there previously. UPDATE III: The Amber Alert has been canceled for Anthony Hernandez, the boy has been found safe.